LONDON — Aston Villa paid tribute to former defender Jlloyd Samuel, who died in a car crash at just 37 on Tuesday, as a 0-0 draw with Middlesbrough at Villa Park booked their place in the Championship playoff final. Mile Jedinak’s header in a 1-0 first leg win for the visitors at the Riverside on Saturday proved enough as Middlesbrough failed to threaten until Stewart Downing’s free-kick hit the bar late on. 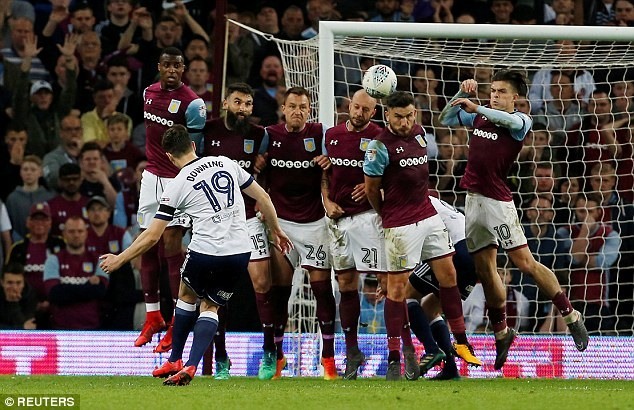 Villa will face Fulham at Wembley on May 26 in what is often dubbed the richest game in world football due to the Premier League TV riches at stake. "We just shaded it over the two games, with a goal from a set-piece, but in the second half tonight there was only one team that was going to win it," said Villa manager Steve Bruce. "It was agony towards the end, if I’m being honest. It means so much." Despite the celebrations as Bruce’s side moved to within one match of bouncing back to the top flight, there was a sombre mood before kick-off with a minute’s applause for Samuel. Cheshire police confirmed earlier in the day that the former Trinidad and Tobago international had been killed when his Range Rover collided with a van early on Tuesday morning. Samuel spent the majority of his career at Villa before moving on to Bolton and loan spells at Gillingham and Cardiff before ending his playing career in Iran. Despite their late escape, Villa were well worthy of their place in the final as Boro ’keeper Daniel Randolph kept the visitors in the tie for long spells. Bruce is now just one game away from a fifth promotion as manager to the Premier League, having also taken Birmingham and Hull up via the playoffs. "The game plan was superb so the manager deserves a lot of credit for that," said Villa captain John Terry. "There’s a great team spirit among the boys. One more step and it’ll be the dream." Villa centre-back James Chester wasted the best chance of the first period when he hooked his shot wide from close range. Randolph then came to the fore as he made two fine saves from Lewis Grabban before getting fingertips to a long-range effort from Jack Grealish. Middlesbrough hadn’t even produced a shot on target until a controversial moment three minutes from time. Villa ’keeper Sam Johnstone was only booked for making a save outside the box from Adama Traore’s attempted chip.